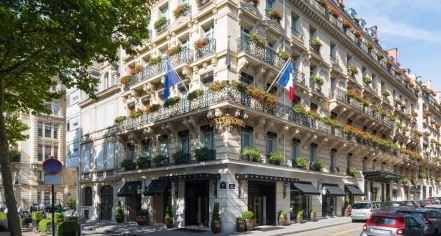 The glorious Sofitel Paris Baltimore Tour Eiffel started as a luxurious private residence constructed by the architect Paul Lorin, who recruited Gustave Eiffel to help design the building. The structure is known throughout Paris for its astounding Haussmannian façade. By the 1920s, Lorin’s urban palace had been transformed into a magnificent luxury hotel. Among its first guests was Lord Baltimore, who frequented the location for its proximity to the city’s many inspiring cultural landmarks. 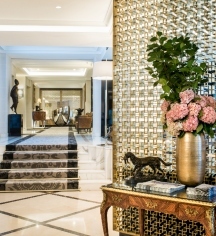 The Sofitel Paris Baltimore Tour Eiffel boasts a number of luxurious facilities that will make any stay in Paris magical. Its 158 beautifully decorated guestrooms and suites are certain to enchant all who stay inside. The accommodations have been renovated to promote for the complete rejuvenation of both the heart and soul. Guests will enjoy the exquisite dining options available at the hotel as well, with awarding-winning cuisine served at both Carte Blanche and Le Bar du Baltimore. The hotel’s spacious meeting venues provide the perfect environment in which to host any professional or personal event. Nestled within the heart of the city’s 16th arrondissement district, the Sofitel Paris Baltimore Tour Eiffel is splendidly situated to allow for its guests to explore the grandeur of this magnificent community. Numerous iconic landmarks abound around the hotel, including such timeless wonders as the Eiffel Tower, the Arc de Triomphe, and the Champs Elysées. All of these fantastic destinations fall within Paris’s magnificent UNESCO World Heritage Site. And if guests remain stumped about where to start, they can gain advice from the hotel’s interactive information kiosk, nicknamed Tom. Sofitel Paris Baltimore Tour Eiffel, a member of Historic Hotels Worldwide since 2018, dates back to 1892. The Sofitel Paris Baltimore Tour Eiffel features an iron balustrade designed by Gustave Eiffel, who also designed the Eiffel Tower. Cancellation Policy: Cancellation policy depends on package or rate booked. Cribs: Available upon request; complimentary. Extra Person Fees: Fees vary, dependent on type of package booked. Hotel/Resort Fees & Taxes: A tax is imposed by the city: EUR 3.3 per person, per night. This tax does not apply to children under 18 years of age. Parking: Valet and self parking are available, surcharge. Payment: Visa, MasterCard, Amex, Diners Club International, and JCB are accepted. Pet Policy: EUR 20 per pet, per night. Rollaways: Available upon request, rates apply. The glorious Sofitel Paris Baltimore Tour Eiffel started as a luxurious private residence constructed by the architect Paul Lorin, who recruited Gustave Eiffel to help design the building. The structure is known throughout Paris for its astounding Haussmannian façade. Learn more about the History of Sofitel Paris Baltimore Tour Eiffel .